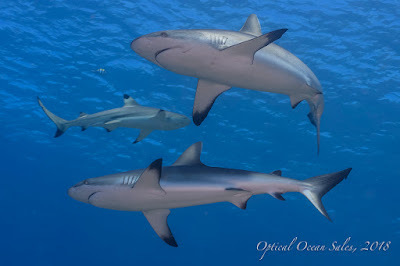 Dropping into the warm, crystal clear water we spotted at least 3 or 4 species of sharks all in good numbers. We were on a shark dive on the remote outer reef of the Micronesian island of Yap. Grey reef sharks of moderate size, lots of smaller black tip reef sharks and quite a few larger silvertips were nosing around us looking for their afternoon snack. Good for us it was a small “chumsicle” of frozen fish, which they eagerly attacked on the bottom. For the next 45 minutes we excitedly clicked away and enjoyed the show. While the sharks were definitely curious about us, they kept their distance. Certainly, a great dive. After many hours of flights on through the night and day, fifteen of us had arrived early in the morning the day before to this small island paradise for the first stop in our 2018 OOS South Pacific Photo Expedition. Manta Ray Bay Resort on Yap was very well-organized and had us in our rooms quickly and up and diving by late morning the next day. The hotel is getting old now, and while it could use some updating, was spacious and comfortable. Meals were taken in their converted wooden sailboat anchored permanently on-site. They were surprisingly good, with lots of choices, even pizza! 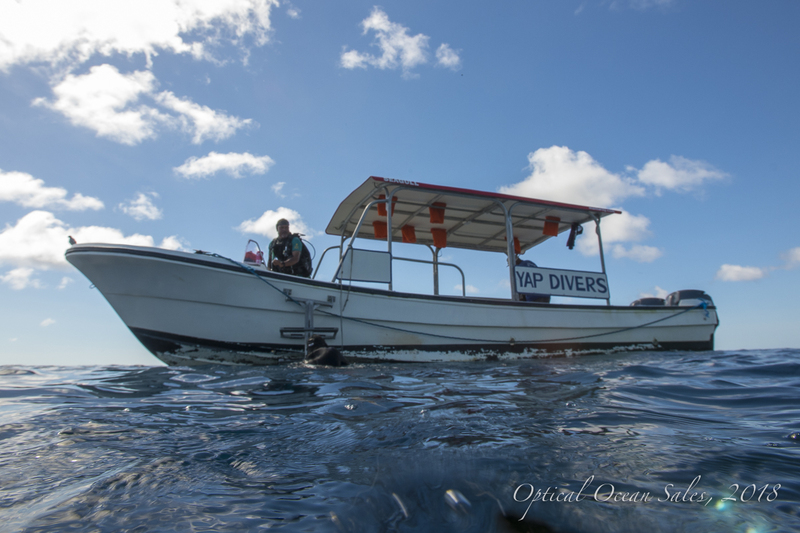 Yap Divers had excellent facilities featuring “VIP” service where they take complete care of all your gear other than your wetsuit. There was a large camera room, and rental dive gear was available. The guides were excellent, and nitrox fills were included in our 3 dives a day package. 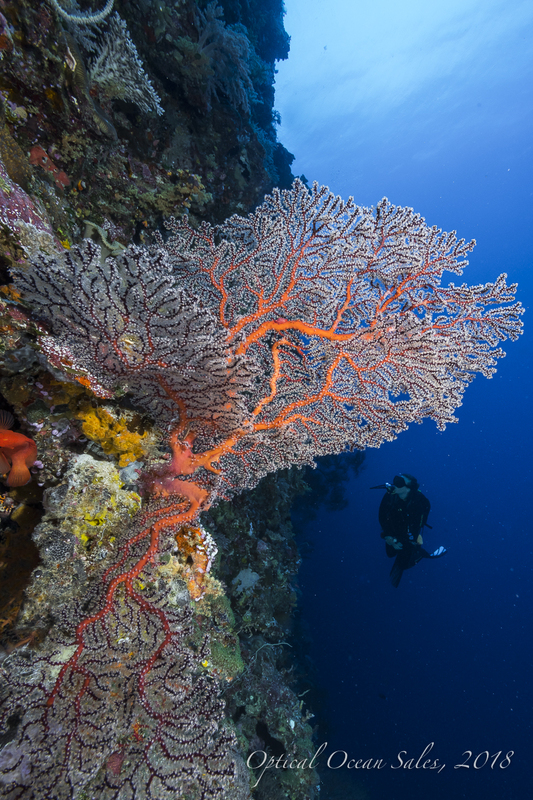 The diving in Yap is nearly all hard coral on fringing reefs. 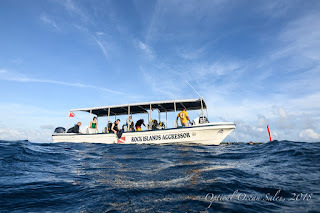 This mostly necessitated long boat trips out through the mangroves, and winding channels along pristine coral reefs out to the blue. The first day was somewhat cold and raining hard to our surprise. It meant we had to go pretty far out to get away from the run-off and green water. The hard coral reefs and walls were pretty, and the geography spectacular underwater, but besides fish, there was little invertebrate life or colorful soft coral. 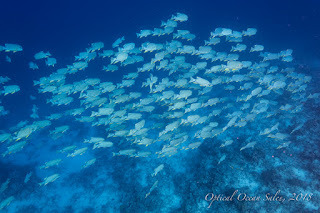 Still the dives were fun, well run and organized which made my job as group leader easy. 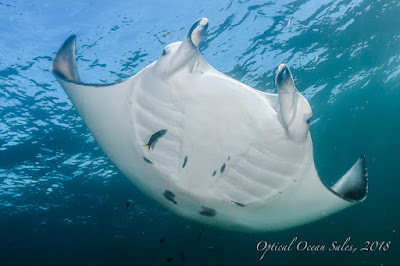 The next day we ran out to see if we could find some mantas, as Yap is noted world-wide for these huge gentle fish. The mantas there are mostly “reef” mantas, and smaller than the large pelagic versions, but quite numerous. Or so we’d been told. 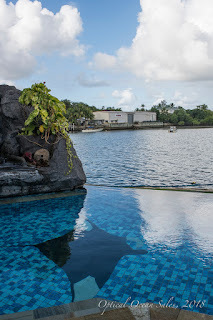 The green water runoff to the lagoon made visibility pretty poor and the mantas stayed home. The following day we went back and after waiting nearly 45 minutes, we were finally rewarded with a couple of mantas dancing around our heads for 10-12 minutes and we nailed a few keeper photos. Along with the shark dive that afternoon, we had a great day of it. 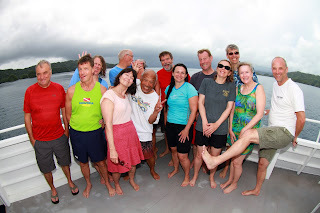 After more dives in clear water, and a fun tour and picnic on the Manta Bay Resort’s private beach, we were ready for the next leg of our trip to Palau. United Airlines in their wisdom has decided that you can’t just take the old short “hopper” flight directly from Yap to Palau. 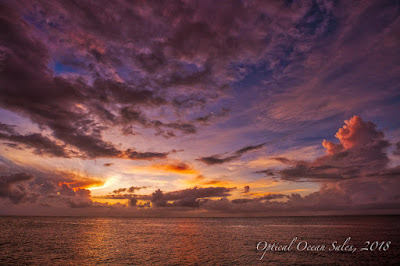 You now have to return to Guam, wait most of a day, and then fly to Palau. This is a lot less than convenient, and Guam is not my favorite place to hang out. And of course, the street in front of our airporter hotel was blocked by a once-a-year marathon race and we had a heck of a time getting to it. 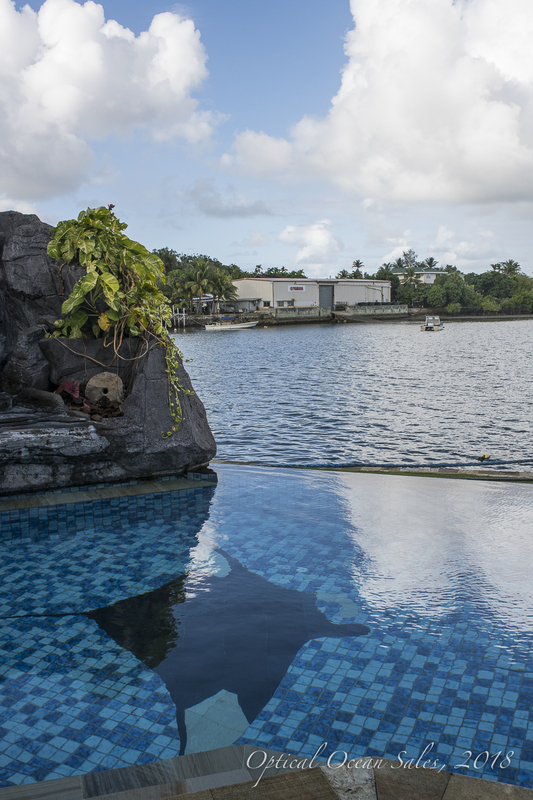 But all the logistics worked out, and we arrived in Palau later that evening and were met and taken to the Rock Islands Aggressor for our week’s long trip around the islands there. 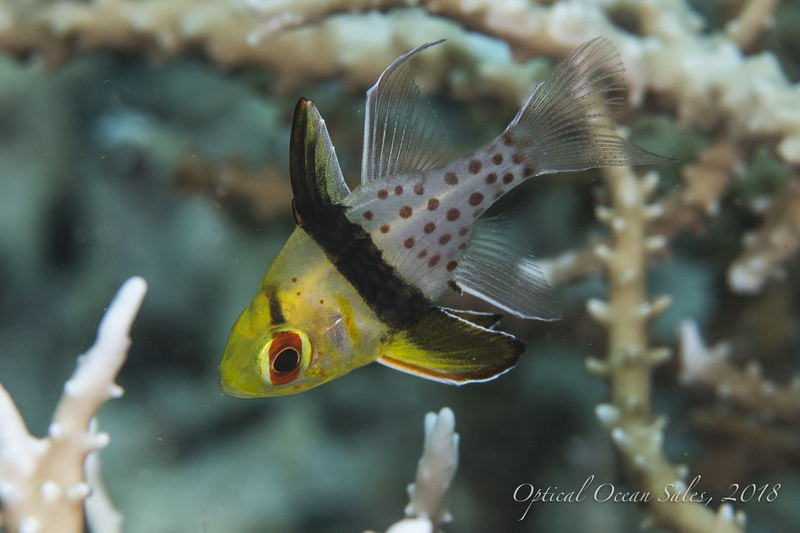 This was the second OOS Aggressor Palau trip and having enjoyed a great trip 3 years ago, it seems like Palau is one of those destinations that bear repeating. I think what is most interesting from a photographers’ perspective is the shear diversity of shots and situations you encounter, from pristine walls and reefs, sandy “bommie” covered bottoms, unique dives in German Channel, the caves and caverns of Blue Hole and Siaes Tunnel and world-famous high current dives on Blue Corner, Big Drop Off and outlying walls on Peleliu. 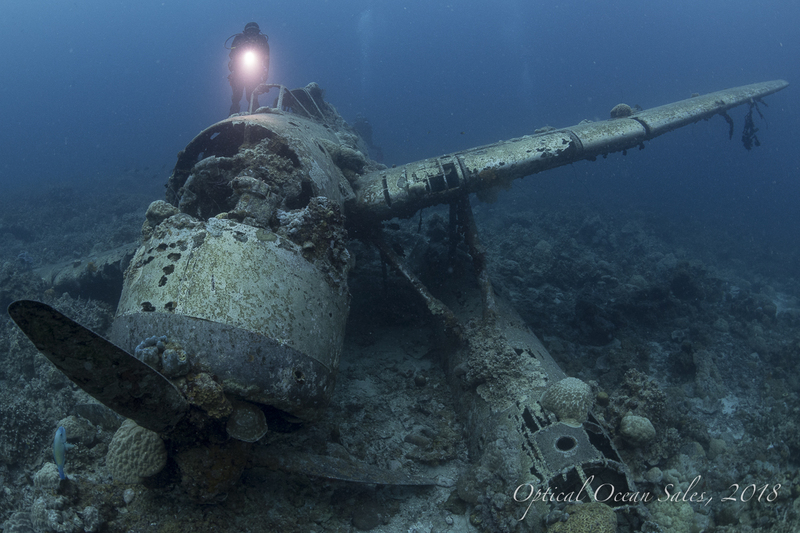 Besides all the great reef and wall diving, there’s also a multitude of WWII wrecks and every dive has surprises; sharks everywhere, mantas, eels, huge schools of every fish imaginable, and lots of macro and invertebrate life. Which is pretty much what we enjoyed that week on the Aggressor! These boats are huge catamarans, created as dive boats and are very comfortable. We were short a few divers, so the fifteen of us spread out a bit in the eighteen-passenger boat. The dive deck is a bit smaller than you’d think, as all the tanks and dive gear other than your mask and wetsuit, stays on the auxiliary hard boat dive skiff. Divers just walked on board the skiff, loaded up cameras and the skiff is lowered into the water on a hydraulic lift! No death-defying leaps into inflatables, or difficult to crawl up ladders. We also could all backroll into the water in two groups, which meant that we could get our entire boat load into the water in a couple of minutes. A definite plus for bluewater, high current dives. They’ve gotten rid of the large circular camera table that wasted a lot of space and replaced it with 3 long tables with 2 shelves which work out much better. Besides a comfortable lounge and bar (with free beer and wine), there’s also dinette tables. Meals on the Aggressor have improved from their already good service to absolutely outstanding! Our chief prepared breakfasts to order, lunches with lots of great selections like sushi, pizza, salads, soups, and mouth-watering fine dining dinners served at your table. I felt like they had really stepped up their food from the last trip. The cabins were generally comfortable, and the a/c now well controlled (many boats don’t have good thermostats). I think the only drawback to the layout of the Palau and Rock Island Aggressors is the old-style bunk bed cabins. They’re fine for couples, with a larger double below but for singles, they are uncomfortable as older customers don’t like the climb up to the narrow upper bunks. We also had some smelly holding tank issues with the boat showing its age, but, to be fair, it was going into annual maintenance the following week. But back to the diving. One of the problems with Palau is that it’s a bit over-loved by close-by Asian nations. 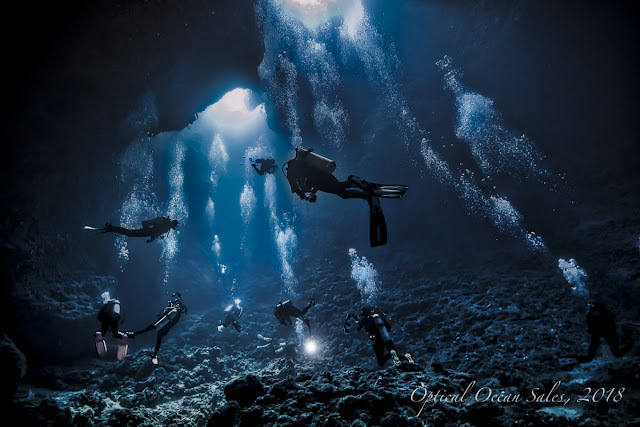 These groups tend to be culturally exclusive and use their own hotels, dive operations and guides. As groups they also aren’t usually the most experienced divers. The day boats have long rides in the morning and afternoon, so the good thing is that from a liveaboard it is easy to avoid these multitudes of divers by being able to dive earlier and later in the day. Or we could get to outlying dive sites, not accessible for the day from Korror. 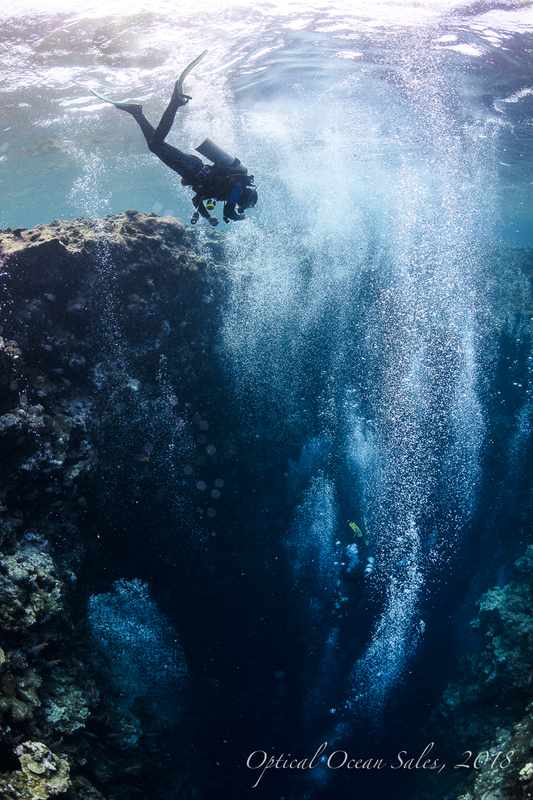 For divers wanting a more remote experience, it’s getting harder to find on Palau. Several times we were over-run by these eager, but inexperienced groups, or had to wait for them to leave the sites before we could dive. But we got lots of dives in and were able to do 4 dives a day, with a few night dive opportunities as well. 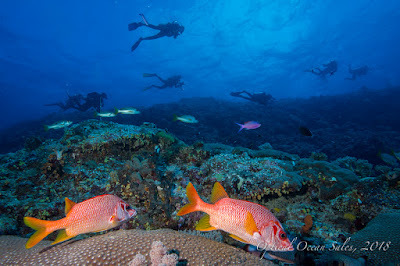 We had an outstanding dive on Peleliu with the clearest visibility of the trip. We lucked out and were able to experience the once-a-year mating congregations of long-finned snappers with thousands of fish moving along the bottom of the wall like a freeway, then bunching up and forming a vertical mass. 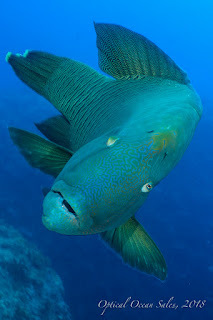 We had the same luck finding a once-a-month congregation of bump-headed parrot fish with hundreds of the large fish massing together and shooting to the surface spewing eggs and sperm. It all happened so fast it was nearly impossible to take photos of, but they were a very unique experience that we all enjoyed. 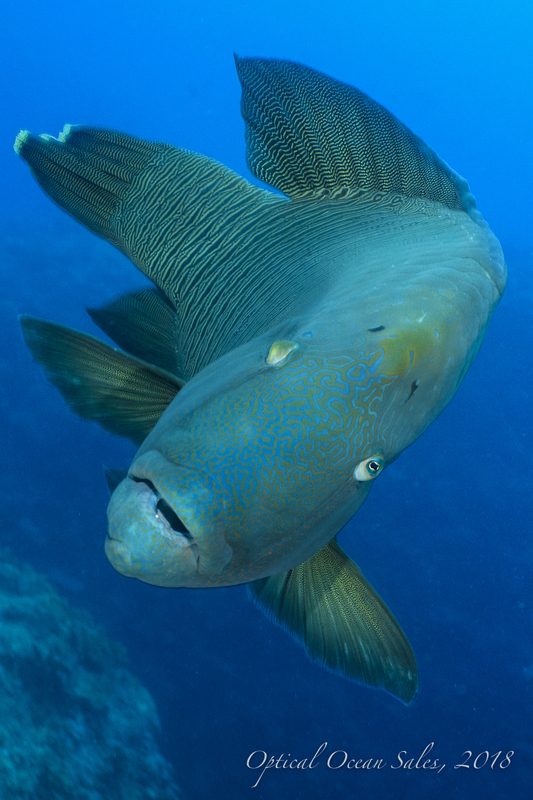 Blue Corner didn’t disappoint with lots of grey reef sharks swimming by, huge schools of jacks and a very gregarious and friendly napoleon wrasse hamming it up for photos. 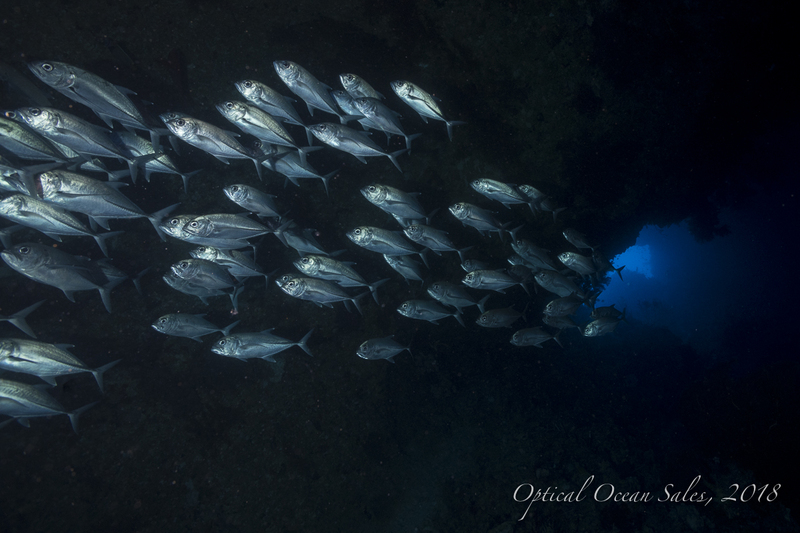 Siaes Tunnel (really a cavern) is deep, with the entrance at about 90’ but we were surprised by a large school of jacks hiding there and the four unique small macro fish were spotted, living nowhere else on the reefs. Jellyfish Lake is still closed as the jellies have died off, originally due to drought or overuse, but now nobody is quite sure of the issues there. However, we had a great dive on the Jake Seaplane with good visibility in the lagoon, and we finished the trip with an excellent macro dive right outside of Chandelier Caves with lots of unique finds like mandarinfish, two-spotted gobies and pajama cardinalfish posing for our lenses. Once back to Korror, the crew on the Aggressor dropped us off to a very nice new rooms at The Cove Resort until our trips home started that night. On the way back, a few us stayed over in Honolulu and enjoyed a quick trip to the Pearl Harbor Memorial for the morning. 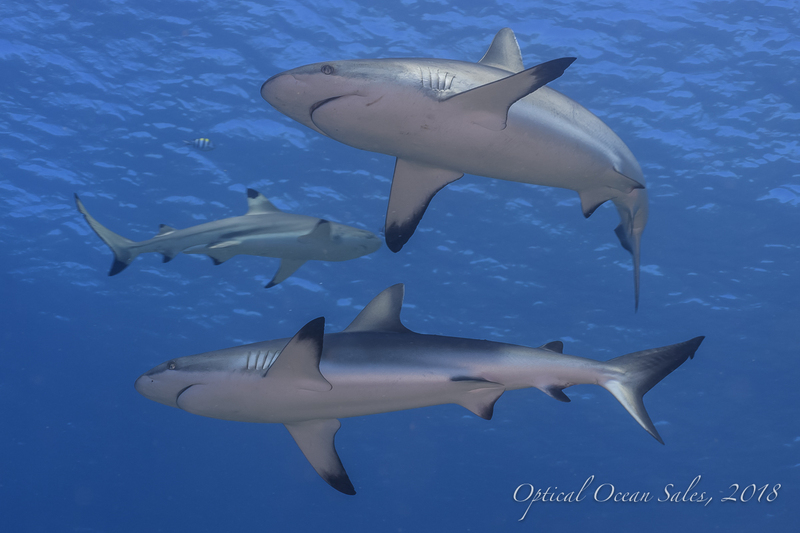 All in all, the 2018 OOS South Pacific Photo Expedition was a very successful trip with lots of great dives and hundreds of photos to edit! Photos taken by Jack Connick with a Nikon D850 with Nauticam NA-850 housing. View more photos here.